Welcome to day #1 of the Taylored Expressions March Release sneak peeks! I am very excited to be part of the Baker's Dozen Design Team and I've had a blast over the last few weeks making projects for this new release. For my first card today, I used the brand new set called Shade Tree Scripture along with a few fabulous Taylored Expressions dies ~ Shade Tree Cutting Plate, Pockets and Pages 3x4 Photo Frame, and the Small Scallop Border. The Shade Tree Scripture set includes 7 beautiful sentiments and Bible verses. I also added a bit of texture on my card with two different polka-dot embossing folders. May Arts seam binding and twine along with a brown button and some brown gems finish off the card. My second project today features the new Neighborbood Border Die. The windows and doors all cut out, but I'm showing them both ways on my card. I just added a few scraps of kraft cardstock behind the openings. For the background, I used the Hearts Cutting Plate; however, instead of using it as a cutting plate, I put an embosser mat over it when I put it through my machine and just embossed the background. I popped up the border with some foam squares for dimension. For the tag, I used the fun new stamp set called Welcome Home and inked it up with Memento Tuxedo Black on kraft cardstock. Using a tag punch, I trimmed out the sentiment. Then I stamped it two more times and stamped it on the teal cardstock and again on red. I trimmed out the house and the heart and cut them out to add to the little house. 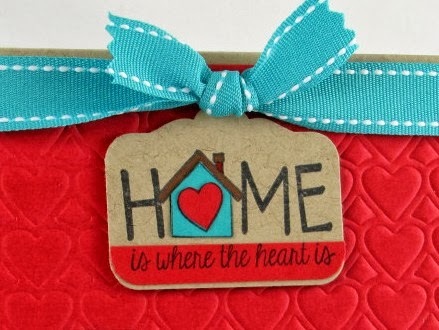 From the stamped image on the red cardstock, I punched out the bottom of the sentiment and added it to the tag. As a final touch, I added some coordinating ribbon and trimmed it with my pinking sheers. 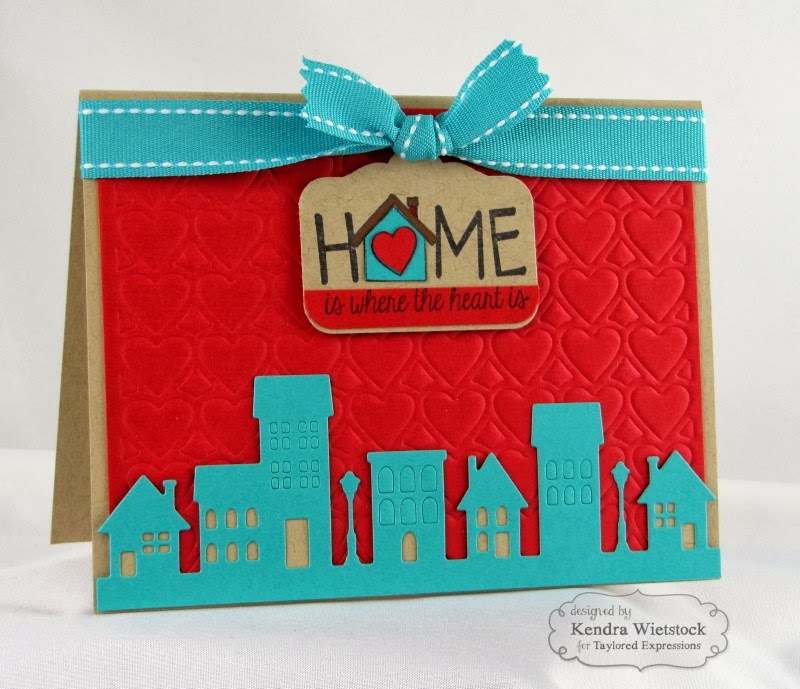 By the way, the Welcome Home stamp set has 17 house building images and 8 sentiments AND... there is a coordinating die set called Build A House. Super fun!! Visit the TE Blog each Sneak Peek Day this week for details on how you can enter to win. All of the new products being shown today through Wednesday will be released this Thursday, March 6th. I know you'll want to hop around and see what everyone created today with the first set of sneak peeks. What beautiful cards! I love that second one, the embossed heart background with this die is wonderful. so much detail, they are great. I love all the embossing! I need to do more of that. Thanks for some great inspiration. Great cards! Love the new dies and stamps! I love the bold red and teal color scheme. So pretty! Great cards. Love those two new dies. Both of your cards are so adorable! Love how you used just a part of the tree! And the heart embossed background is such a great detail on the neighborhood card! A couple of really great cards! Love the sentiments for Easter. Thanks for sharing.